Who Were the First Surveyors? 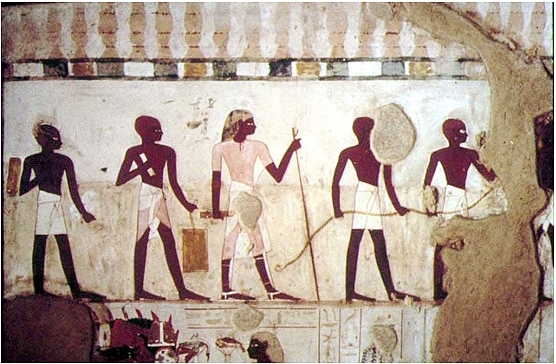 Four Surveyors of the Gods: In the XVIII Dynasty of Egypt – New Kingdom c. 1400 B.C. 1) This paper has been prepared to the Workshop on History of Surveying to be held during the FIG Working Week / GSDI-8 Conference in Cairo, Egypt, April 16, 2005. I have often heard it said, and even seen it written, that no one actually knows who the surveyors of ancient Egypt were ! This could not be more distant from the facts ! In reality, even though the harpedonaptae (“rope stretchers”) who were the surveyor’s assistants were not individually known, the master surveyors were not only well known but each even had his own tomb adorned with wall paintings and hieroglyphics of a biographical nature attesting to their achievements and status during their lives in the service of the King. Ironically, the four well testified Royal Surveyors, or Scribes of the Fields, as they were officially titled, are all from the Eighteenth Dynasty of the New Kingdom (around 1400 B.C.). This is the period of the ancient culture most renowned for producing such notable characters as the Thutmoses (four main ones), Akhenaten, Nefertiti, Tutankhamun, Hatshepsut, and Horemheb, the great general. It is not surprising that to this very active, and somewhat turbulent era, we can attribute the four Royal Scribe Surveyors, Amenhotep-si-se, Djeserkareseneb, Khaemhat and Menna, through whose funerary monumentation we can take a colourful and exciting trip back nearly 3500 years to experience Royal surveying – Egyptian style ! In the following paper you will meet these four surveyors, see and hear about their lives and families from their biographical tomb paintings and inscriptions, as well as finding out some more information regarding the most colourful and legendary times in which they lived, where they were interred and under whose Pharaohnic rule they worked and were buried. A five year record of the exact flood heights of the Nile River are present on the fragment of the Old Kingdom basalt stele known as the Palermo Stone dated to about 2350 B.C., near the end of the Egyptian Fifth Dynasty. The stone also bears a full King List from the first Pharaoh, Menes, together with other historical details of the previous 500 years including a reference to a “numbering of gold and lands.” Sir Henry Lyons in his 1927 article in the Royal Geographical Society Journal purports that this “numbering” of the Royal possessions, made every two years throughout the land by the officials of the Treasury, would have been a sort of verificatory survey of the State property which doubtless included herds as well as land, and this biennial census was so regular a procedure that events in the reign of the King were dated with reference to it. What is demonstrated on this stone is a firmly established and well administered bureaucracy containing Treasury, Land Registration and Survey Departments which played a major hand in the phenomenal capital works program of the Old Kingdom (2700-2200 B.C.) during which the Great Pyramids of Giza were so accurately set out and constructed. From a 2700 B.C. wooden statue of the temple official, Mitry, known as the Councillor and Overseer of Boundaries, it can be seen that even as early as the very beginnings of the Golden Period of the great civilization itself, there was a very strong and active administration of surveying annexed to the King’s government. Only the children of the upper class were chosen to be offered the divine privilege of scribe training, which was a rigorous regime from the age of twelve (12) years for some dozen or more years to learn over 700 hieroglyphic signs and other practical skills in many areas. Strict discipline from dawn to dusk was based on the motto: “a boy’s ears are on his back.” A Scribe of the Fields was multi-skilled in surveying, calculation, agronomy, engineering and other associated areas, as testified on the biographical depictions of their lives on the walls of their tombs, just like our four Cadastre Scribes who will feature in this presentation. The period of the great civilisation known as The New Kingdom extended from 1550 B.C. right up to the Third Intermediate Period (1069 - 747 B.C.) and was particularly noteworthy not only because of the multitude of colourful characters who featured throughout it but because it is certainly the most well known era to the modern world through Howard Carter’s phenomenal chance discovery of the undisturbed tomb of the young Pharaoh Tutankhamun in 1915. The Eighteenth Dynasty (1550 B.C. –1295 B.C.) of the New Kingdom was the one which produced not only this young ruler but also his father Akhenaten, his exceptionally beautiful stepmother Nefertiti, Thutmose the Third, the legendary female Pharaoh Hatshepsut and the Leader-General Horemheb. The accession of Amenhotep IV to the throne in 1352 B.C. heralded the commencement of 16 tumultuous years of upheaval and conflict within the religious bureaucracy of the great civilization. Abandoning over 1700 years of well established theological doctrine Amenhotep IV renamed himself Akhenaten while at the same installing a single god of his own, The Aten, as the sole deity to which the population were ordered to pay homage. He put a ban on all other divinities to such an extent that he had a team of vandals who went around to all recent tombs with reverence to the Amun obliterating not only the references to this deity but also the faces of the tomb owners to rob them of vision in the next world and the ability of the deceased to make his journey across to this hallowed destination. Even though Akhenaten’s actions were reviled and vilified by the subsequent Pharaoh’s, the first being his own son Tutankhaten who changed his name to Tutankhamun in protest at his father’s heretic and disruptive actions, he maintained a very high respect and dependence on his Cadastre Scribes who were precise and professional in surveying the monumentation for his new capital city of Akhetaten and the many fine edifices which arose within it. Some fifteen of the original “Boundary Stelae of Akhenaten” still survive today bearing testimony to the accurate surveying skills of the Cadastre Scribes, three on the western side of the Nile cut into limestone cliffs along the edge of the cultivation and twelve to the east following the hills that form the desert bay next to the river in the area now known as El-Amarna. Events of this epoch crystallised the modern day fascination with the ancient race and catalysed the evolution of Egyptology into a modern science mainly through the remarkable contributions of men such as Champollion, Flinders-Petrie, Maspero, Gardiner and the rest of the Renaissance archaeologists who advanced the excavations of Egypt’s landscape from a buried treasure hunt into a credible collection and collation of the history of the ancient culture. Each of the four tombs of the Scribe surveyors whose stories are to be detailed here are rock-cut tombs at Thebes in southern Egypt on the western side of the River Nile almost adjacent to the famed Ramesseum, a grand temple built in honour of Ramesses the Great, to the north east of the Valley of the Queens and due south east from the Valley of the Kings. The name of this cemetery bearing many of the nobles from the Eighteenth Dynasty is Shaykh Abd al-Qurna which is named after the domed tomb of the local saint, having the largest concentration of private tombs in the overall Theban necropolis. Including other burial places named Dra Abu’l Naga, Asasif, Al-Khoka, Qurnet Murai and Deir el-Medineh the overall Theban necropolis contains graves of many of the craftsmen who dug and decorated the royal tombs of the Valley of the Kings. In total there are some 414 numbered private tombs in the necropolis with 371 dating to the New Kingdom and Late Period, 173 of which can be placed within Dynasty XVIII. It should be carefully noted that these New Kingdom private tombs were cut into the limestone cliffs on the western slopes of the Theban mountains and that the actual burial chamber lays beneath the tomb chapel which is the part most often referred to as the “tomb” and holds the majority of the painted decoration and statuary. Most of the structures followed the typical contemporary style of the inverted “T” shape bearing biographical images and text laid down in a given format of splendid artwork, vivid colour and lively animated scenes of both the mortal life and after-life. Amenhotep-si-se was referred to as a “Second Prophet of the Amun” during the rule of Thutmose IV (1400-1390 B.C. ), the suffix to his name literally meaning “the son of a man” or “the gentleman” which was a direct reflection of his family’s wealthy status within the society. 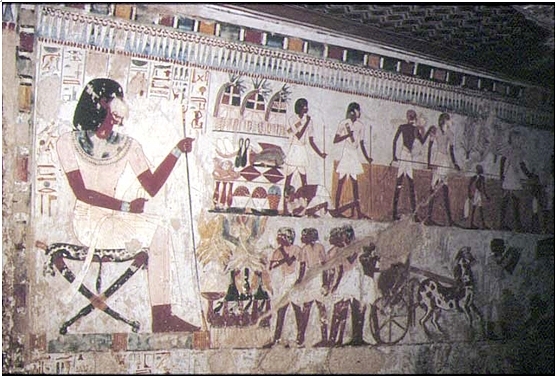 Paintings on the left wall of the entrance show some temple craftsmen and field surveyors at work some of whom carry the coiled measuring rope in the cache of the Ram’s head of Amun symbol on their upper arms while on the wall opposite the tomb owner is shown making gifts and donations of statues, a harp and some containers. On the wall at the right of the entrance the deceased is having a meal with the opposite wall depicting the dead man going to his relatives with others to the Amun Temple at Karnak and being welcomed by a priest upon arrival. Khaemhet, who was also known as Mahu, was a royal Scribe during the rule of Amenhotep III (1390-1352 B.C.) more officially entitled “Overseer of the Granaries of Upper and Lower Egypt.” His tomb is one of only four private tombs to be decorated with reliefs and is specifically dated to the 30th year of the reign of the king i.e. 1360 B.C. Tiyi (or Teje) is named as his wife but there is no mention of any children with only one other individual apart from the king being referred to, the Scribe Imhotep. George Lloyd, an amateur archaeologist discovered the tomb in 1842, but he died shortly after when his gun accidentally discharged. The tomb has suffered severely over the years with later occupation by hermits causing much fire related damage. However the most inexcusable ruination of the art came when the early explorers used a technique of extracting squeezes of the images using water-softened newspaper pushed onto the walls. The entirety of the coloured wall paint transferred successfully onto the newspaper but was stripped permanently from the walls. Fortunately the reliefs underlying the scenes still remain today to give us an animated collection of interesting life images. 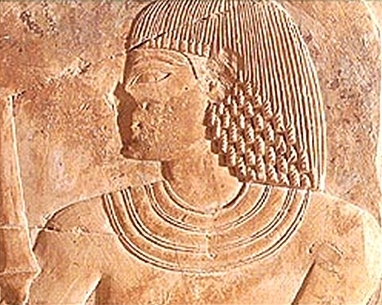 The relief of Khaemhat’s profile remains with the Berlin Museum (see photograph). The tomb design is a more intricate variant of the normal “T” shaped tomb having the usual entrance court but with three rooms in total. Steep steps take you down into the courtyard where a stela shows canopic jars and the instruments used for the “Opening of the Mouth” ritual. Through a short passage leads into the transverse offering hall where a replica cast replaces the bust of Khaemhat at the Berlin Museum. To the left of this he is seen making offerings to Amun and Re-Horakhty above offering bearers and butchers. Amongst the agricultural activities which follow is the measuring and recording of the crops by the survey party with the sacred rope. There also scenes of the unloading of freight ships, produce carried to the market and Khaemhat offering a sheaf of corn to the serpent goddess Renenutet (Termuthis) who is suckling the infant monarch. The small southern wall contains statues of the tomb owner and the royal scribe Imhotep with a relief of the deceased’s wife Tiyi between them. On the back left wall men present cattle before Amenhotep III sitting in his kiosk with the other side showing Khaemhat and other officials receiving rewards from the king with a text from his 30th Regnal Year. The northern wall has more offering scenes. Khaemhat is painted before deities in the first hall of the widened passage through a short corridor. Left hand images are of the funeral procession and ceremonies towards Osiris and the Western Goddess while on the right is the Book of the Dead and the pilgrimage to Abydos where one of the boats even contains a horse and chariot. Within the additional funeral rites Khaemhat is portrayed in the “Fields of Iaru” which is the idyllic Netherworld. Priests and mourning women are also present to pay respects to the departed. The inner room next has three pairs of statues – Khaemhat and Tiyi, then with Imhotep and finally with an unknown woman, as well as offering texts and litanies inscribed onto the walls. Within this inner room is a short corridor to a shallow staircase leading to a tunnel circling clockwise down into two small rooms followed by two larger rooms, one of these probably the burial chamber with the other to hold the funerary equipment, but nothing was found here. Without doubt Menna is the most well known of the four Cadastre Scribes as his is the only tomb which shows the survey party holding the measuring rope at full stretch with the knotted divisions clearly visible as well as his tomb painting being the most complete of these category of burials. According to Sigrid Hodel-Hoenes (in her book) Menna was “Scribe of the fields of the Lord of the Two Lands of Upper and Lower Egypt”, saying that he was assumed to be a surveyor or archivist responsible for land ownership records, “that is, a ‘cadaster scribe’.” His name means “lasting” and his wife Henut-tawy was a Chantress of Amun. From Campbell’s original tomb report of 1910 it is stated that Menna had two sons – a Uab or web (libation) priest called Kha, and Sa, probably a Scribe of the Fields (described as a “Scribe of the Reckoning of Grain”) following after his father and “at least three daughters” – Uy, Nofera and Kasi who was very likely to have been already deceased. Hodel-Hoenes attributes only two daughters to him being Imn-em-weskhet (or Amenemwaskhet) who was a lady-in-waiting in the king’s court and Nehem-awayt, but there may have actually been four of them. Both authors acknowledge that there are no direct inscriptions to nominate the Pharaoh served by Menna but Hodel-Hoenes declares that from the similarity of decoration to the nearby tomb of Nakht it is more appropriate to attribute his interment to the reign of Amenhotep III (1390-1352 B.C.) the succcessor of the usually ascribed Thutmose IV (1400-1390 B.C.). Even though the magnificently ornamented tomb paintings were nearly complete, because of the upheaval caused during the reign of the subsequent ruler Akhenaten Menna’s loyalty to the god Amun was punished by contemporaries of the Amarna Period by removing his face and eyes from many scenes in an effort to rob him of the enjoyment of eternal life. Typically classical of rock tombs of the period Menna’s “T” shaped structure bore an entrance corridor (courtyard) leading into a wide vestibule then a shorter corridor through to a long chapel with a niche at the end. “[Hail to you, Re, at your rising! Your heart as wide as the Mandjet-bark. Every day, as a daily custom. Your perfection in my face. In the favour of the good god. Menna’s figure presides over the two pairs of rows of pictures, the second lower register containing three daughters, the first two with splendid head-dresses playing sistrums being touched approvingly by their father. Various individual shots show the reaping and harvesting of the grain, two girl gleaners tearing at each other’s hair, a woman gives a man a drink, and a man rests under a tree. In the bottom row a tired man sleeps under a tree, a girl removes a thorn from another’s foot and the main purpose of the grain operations – ploughing, digging and sowing is seen as well. Menna is represented in his confrontation with the “Weighing of the Heart” ordeal then, having been judged by Osiris and a panel of 42 judges as pure he is transformed from his mummified state into the arisen form. The remainder of the tomb shows active scenes of the deceased’s life and his activities in the afterlife which include fishing with a spear and killing game-birds with a throw stick in a boat among the papyrus thicket with his family. All animal life in the thicket is terrified except for the crocodile chewing on a fish. 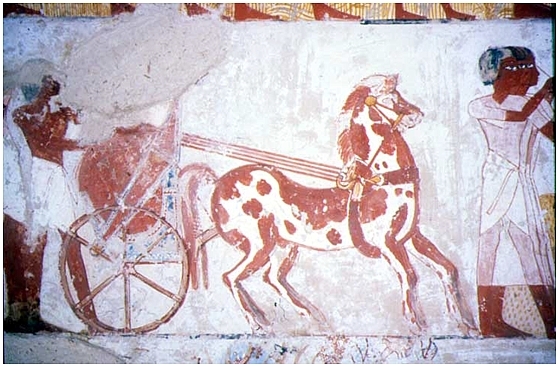 So it is clear that the Cadastre Scribe was not always a welcome sight to those farmers whose productivity was insufficient to meet the burden of their taxes, but it is evident from his horse and chariot (see photograph) that Menna was a figure of status and wealth through his service to the Temple bureaucracy. As with most tombs of this era the artwork was usually done by a group of artists demonstrating slight nuances in the style of the established format. Unfortunately, as was the case with Menna’s inscriptions and many others of that brief but turbulent Amarna era, whole columns of hieroglyphs were removed not long after the burial of the tomb owner. Nevertheless we still are treated to many richly colourful and lively images of the deceased’s life and his send off banquet for his new eternal life. The first views of Djeserkereseneb on the eastern side (left) of the northern wall show him standing over an imposing two registers in height pouring incense over a variety of offerings, with his wife Wadjrenpet dressed in a long white dress standing behind him at an equally impressive height. Behind the two parents comes the eldest son Iri-nacht carrying a large stem topped with a Lotus blossom bouquet. He was also a Scribe like his father, and two brothers were present with him. To the right the standard four registers show two young shaven-headed offering bearers one shouldering two wine casks while the smaller boy carries a big two handled amphora on his shoulder both hastening to the banquet. In the third register there are three stylishly attired young ladies who, although unnamed, are probably his daughters with varying hairstyles and collars, followed by three offering bearers each holding a side of beef, the head of the beast and a duck by the wings respectively, with two men butchering a carcass on a papyrus mat. On the eastern wall the tomb owner is shown in his official capacity for the Amun Temple administration supervising the measurement of the crops and harvesting. In the top register he holds his scribal palette in one hand and his long staff of office in the other while wearing a long transparent kilt and white sandals. His survey party is to the right of him measuring the crop production, which is typically shown as a rich harvest, with a shady sycamore covering jars of refreshment beneath it awaiting them at the end. The middle register has the deceased standing before a tall offering table with a chalice in each hand looking at the burning incense and many gifts like bread, an ox head, dates, grapes, cucumbers and jars of wine. At the rear stands the goddess of the harvest Renenutet in the form of a cobra, described by the attached hieroglyphs as “the provider of nourishment”. South of this wall the tomb owner observes many agricultural activities such as ploughing, seeding and winnowing while leaning on his long staff. The western side of the south wall is devoted to the funerary banquet with the opposite wall mirroring this detail in true Egyptian symmetry. Djeserkereseneb and his wife sit before their two daughters who wear long white dresses leaving one breast exposed as a sign of mourning. Behind them two small servant girls wearing nothing but narrow girdles attend to a guest by fixing her hair. In the centre register there are the musicians, dancers and chorus with all four musicians being female, the leader playing a harp. In the background there are three “clappers” sitting cross-legged on a mat who add rhythmic accompaniment to the music by clapping their hands. Another rare but curious representation shows some guests exhibiting signs of nausea as a result of the excessive consumption of alcohol at the wake ! Perhaps we have learnt too much from our illustrious predecessors ! It is not surprising that there is such a widespread interest in the ancient Egyptian civilisation with its spectacular structures, grandiose burial tributes and artistic hieroglyphic language. For the more specialised there is the thrill of discovering the origins of their own scientific or ornate crafts such as the doctors, stonemasons, lawyers, agronomists, engineers and for us – the surveyors ! With glowing pride we can look back through the most elegant medium of biographical tomb art to catch snapshots of the lives of these four surveyors with their richness of variety and multi-skilled capacities. The highest level of regard and status was bestowed upon these Four Surveyors of the Gods and we may also pay tribute for the most dignified way in which our ancient predecessors so excellently established our fine Profession. I dedicate this paper to the people of Egypt and their great surveyors both of ancient times and the present. Surveying would not be such a professional proud and well-administered institution without the magnificent foundations set down by the most great ancient civilisation. De GARIS DAVIES N., The Theban Tombs Series – The Tombs of Two Officials of Tuthmosis the Fourth (Egypt Exploration Society 1923). FAULKNER, R.O.,A Concise Dictionary of Middle Egyptian (Griffith Instn, 1996). Note: JARCE stands for Journal of the American Research Center in Egypt. John Brock holds a Bach of Surveying (UNSW,1978), MA Egyptology (Mac. Uni., 2000) Registered Surveyor NSW (1981), Licensed Surveyor QLD (1990), Rose Atkins Assoc., Blacktown (10 years), H. Ramsay & Co., Harris Park (1 ½ years) surveying for 31 years, Fellow of ISA, former Vice Pres., committee, convenor of PR & History Subcommittees ISNSW, papers to Survey Congresses in Sydney ,Cairns, Perth, Newcastle, Launceston, Queenstown, NZ, Brisbane, Little Rock, Las Vegas and Hawaii, USA, Port Moresby, FIG Belgium, San Diego, FIG Washington, USA and Canada 2002. Surveying History Seminars in Sydney 1991, ‘94, ’96, ’97 (paper) & 2003 (paper) Paper to the inaugural FIG Congress History Seminar Brighton U.K.1998, ACSM Arizona, FIG Paris, RICS London, Hong Kong 2003, FIG Athens, Jakarta, Auckland, NZ 2004 Halloran Award 1997 for contributions to history of surveying, Professional Surveyor of the Year 2002 at ISNSW Excellence Awards Life member Rundle Foundation for Egyptian Archaeology, Foundation member Australian Nat. Maritime Museum, Friends of Nat. Museum of Australia, Bradman Legacy Member National Trust of Australia, Historic Houses Trust of Australia, Friends of Bradman Museum, Royal Aust Historical Society, Society of Aust Genealogists, Surveyors Historical Society of the USA, Aust Science History Club, International Map Collectors Society. H. Ramsay and Co. Pty. Ltd.